I first heard them chirping a few weeks ago. Four baby birds crying for their mama, nestled safe in a top corner of my covered porch. Periodically I’ve watched from afar. In time, their heads peaked out higher and their morning cries grew louder. But when I peeked out my bathroom window this morning, something felt different. They seemed ready to launch. Not wanting to disturb, I opened normally shut bathroom blinds and perched where I could see them easily through the lens of my camera. The bravest stood straight, his full body exposed. His wings flit about a few times, but then he sank back into the safety of the nest. With the parents gone, the baby birds stirred again. Wings flapped. Necks stretched high. Anxious chirps announced their desire to launch, coupled with concern. Would their wings really work? Would they be able to find food? Was it worth the risk? While I took numerous good photos, my dirty bathroom window tainted the color. So, right when I was certain they were busy worrying about their future, I decided to step outside with Windex and a cloth and wipe my view clean. But when I opened the front door, three baby birds took flight. At first, I was annoyed that I missed the moment. Then, I noticed the remaining sibling. Scrunched down in the nest, I almost couldn’t tell if the silhouette was a bird or a twig. But a close-up photo confirmed my suspicion. One had failed to launch. Concerned, I kept an eye on him. 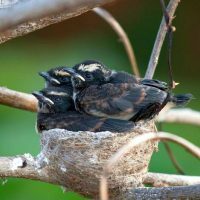 However, not long after, I opened the front door and saw the mama, daddy, and even a sibling bird perched all around the nest. They hadn’t forgotten him at all. They’d come back to regale him with stories of tall trees and high perches. And it worked. By the time I finished teaching a voice lesson 45 minutes later, the nest was empty. My oldest son turned 26 last week, and I spent yesterday afternoon bonding with my 24-year-old son’s five-month-old little boy. Just as I’ve settled into what it means to be a parent of adult children; the cycle has begun again. Our newest little bird will soon be crawling and daily fighting for independence. And the dance between hovering and letting go will ensue. Some days parental instincts will rule. But on many others, only prayer and discernment will guide the way. Having witnessed the launch of one generation, I’m already praying for the next. For just like you, we’ve got a little bird who’s yet to fly. By: Susan Schreer Davis lives with her husband, their cat named, Eggs, and the challenging effects of mitochondrial disease. She leans on humor, family, and faith the size of a mustard seed to maintain hope. Learn more about Susan, her latest book and many songs at www.susanschreerdavis.com.